The Tokyo Metropolitan Museum of Photography in Yebisu Garden Place near Ebisu Station in Tokyo is currently closed due to major renovations. It closed on September 24, 2014. It plans to reopen in September 2016. During the closure, works cannot be viewed or loaned out. The museum library also cannot be used. 1. Do your homework. Study up on the matsuri and find out all the details: exact time, place, route (if it’s parade), etc. Unfortunately, most such information is in Japanese only. If there’s any English info, it’s usually only basic and not exact. (Producing detailed English information is laborious and most official tourist information sources don’t do it.) Online information and printed materials are often not enough for the serious photographer. I often end up calling the festival organizer to find out more details. Or I ask a knowledgeable person at the festival site. So Japanese ability can make a big difference in putting you at the right place at the right time during the matsuri (unless you’re a press photographer or with a knowledgeable guide). 2. Search for online images/videos of the matsuri. You can then get a good visual idea of the festival and identify key vantage points and the shots you want. Before the Internet, the first thing that stock/pro photographers would do when shooting something for the first time is to look at picture postcards at local tourist shops. That’s where they got ideas for shooting. Now it’s from online images. 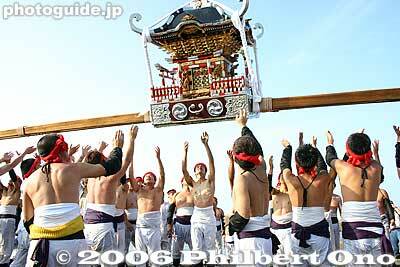 For obscure festivals, there are more matsuri images from Japanese sources. Search for the matsuri in Japanese in such cases. 3. Go early and case the place. Walk around and look for good spots for shooting. If necessary, claim your spot by placing a tripod, etc., where you want to shoot (especially at a parade). 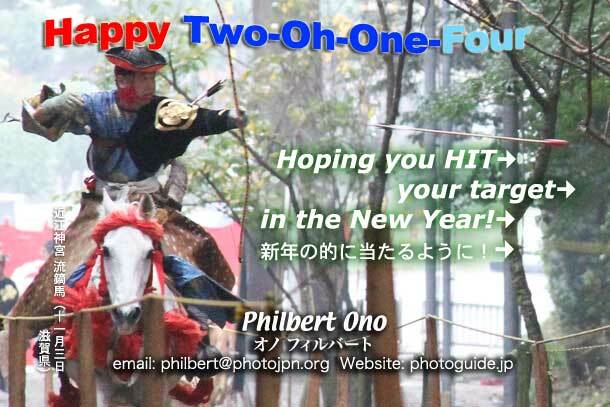 Note that there are many maniacal photographers in Japan and they will show up early at the best shooting spots. 4. Often times, you won’t get the best shots when you shoot a matsuri for the first time. But if you see it again, you will know what will happen and where. Armed with better knowledge and experience, you will be able to shoot better shots the second time around. 5. Most people in a festival would be happy to pose for you if you ask them. As long as they’re not busy at the moment. 6. Using a step ladder can be good or bad/dangerous, depending on how crowded it is. Don’t use a step ladder where there is a moving crowd of people. They can trip over the ladder and knock you down. 7. For crowded matsuri, best not to carry a large camera bag. People will bump into it, shaking you and your shot. People (especially kids) getting hit by your bag or camera may also get upset or hurt. 8. Besides bad weather, the festival photographer’s worst enemy is another photographer. And these days, almost everyone is another photographer with a camera phone in hand. Not to mention the hordes of amateur and elderly Japanese photographers. Expect some great shots to be ruined by a camera-wielding hand/arm/head/body in your shot. 9. When showing your matsuri photos to people and friends, you should explain what the matsuri is about. How it originated and the significance of the matsuri. Such basic details will increase the viewer’s interest in the photos much more. This might be hard if such information is in Japanese only and you cannot read Japanese. Hasselblad model at CP+ 2014. 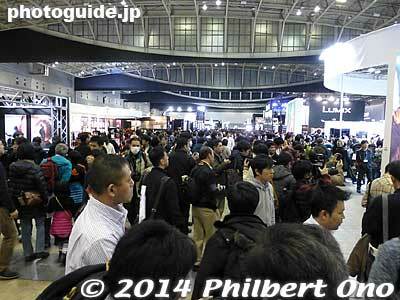 CP+ 2014 (Camera & Photo Imaging Show), Japan’s largest camera show, was held on Feb. 13-16, 2014 at Pacifico Yokohama. We went on Sunday, Feb. 16, 2014, the day after they canceled the show due to heavy snow. By Sunday, most of the snow had melted and it was sunny. It wasn’t crowded at all to get in at around noon on the last day. Last year on the first day, there was a long line to get in. Now I know which day to avoid. Inside, the show was crowded enough. Hordes of men taking pictures of the pretty girls. 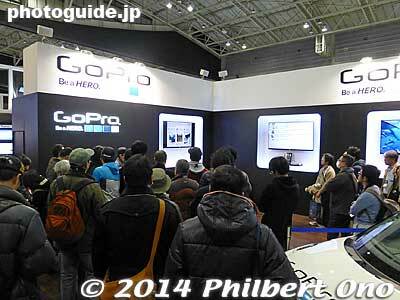 But some booths like Olympus and Nikon restricted picture-taking to only people using their demo cameras. You couldn’t shoot with your own camera. Other booths like Ricoh/Pentax and Panasonic had models posing for anybody. Crowd control measures it seems. It’s not a big show, no professional equipment. Mainly for general consumers and amateurs. Sometimes the staff can be amateur too when they cannot answer your technical questions. 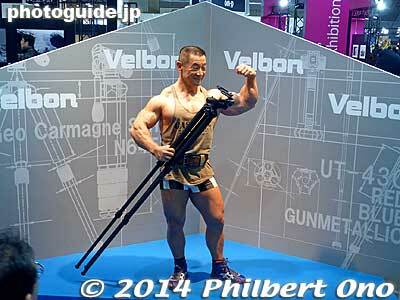 Muscle man with a tripod. For the ladies I guess. Available only in Japan. 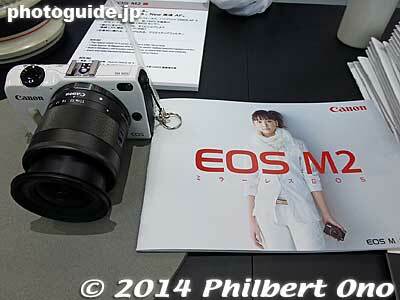 Mirrorless EOS M2 camera. 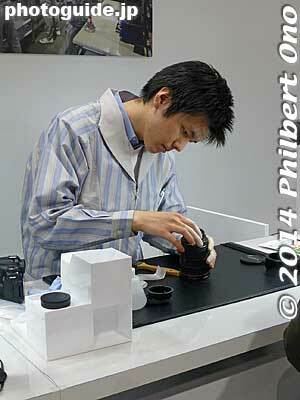 Canon booth had a free EF lens-cleaning service. Normally it costs 500 yen at a service center. About 10 people were waiting in line for this. 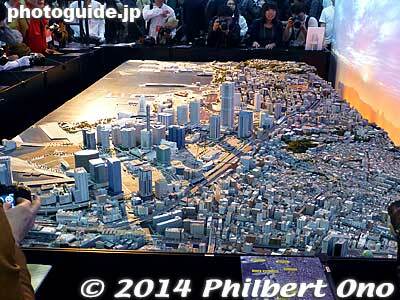 Nikon booth had this diorama of Tokyo. GoPro showed that their action cameras were smaller than a business card. 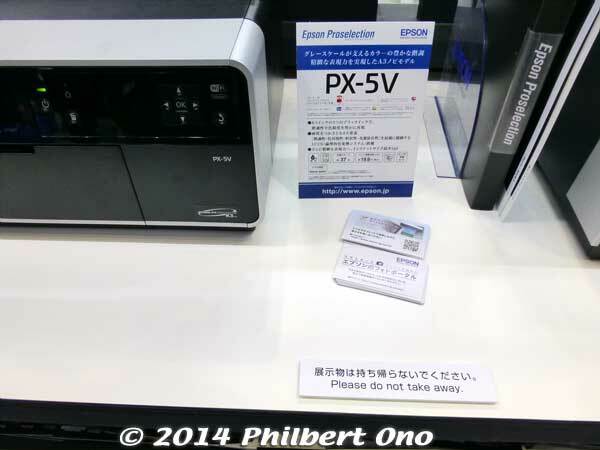 Epson booth had this weird label saying “Please do not take away.” In Japanese it means “Do not take home the display model.” Were they afraid that someone would walk away with a printer on display? 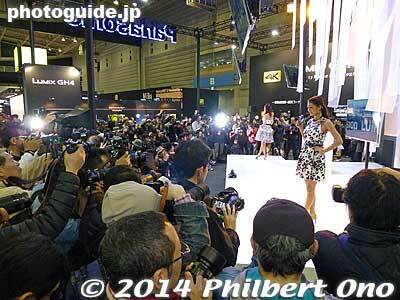 Pentax/Ricoh had a bunch of girls posing for anybody. 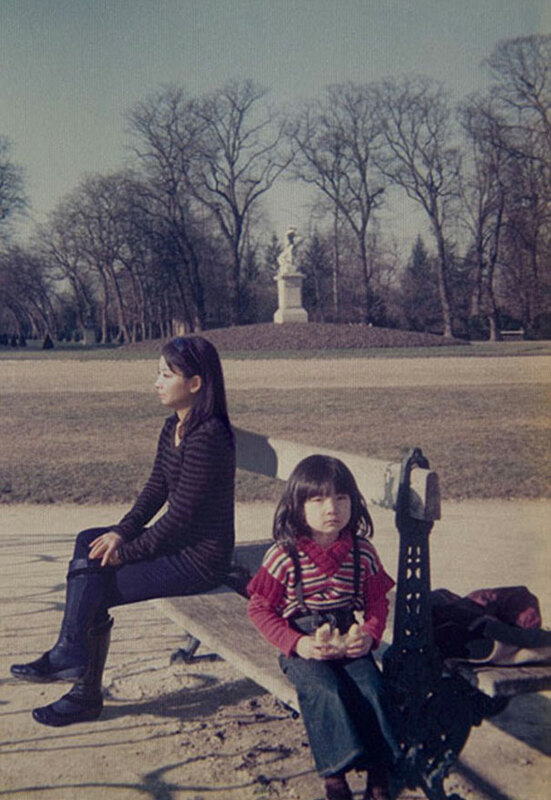 Another interesting photo theme with Chino Otsuka’s “Imagine Finding Me” series showing photos of her present self posed next to her child self in traditional scenes. Very skilled Photoshop work of compositing her adult and child images in one photo. Double self-portraits in a kind of time travel. Both girls in the photo are her. Very neat and unique video (or still) of people waiting for the train at Shinjuku Station. By Adam Magyer. Hope you capture a lotta great shots in 2014! 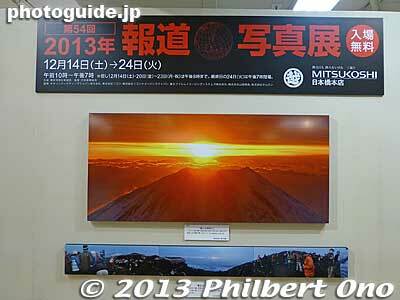 The 2013 Japan News Photo Exhibition (報道写真展 Hodo Shashinten) is being held at Mitsukoshi Dept. Store (7th floor) in Nihonbashi, Tokyo until Dec. 24, 2013. This was the award-winning photo at the news photo exhibition. 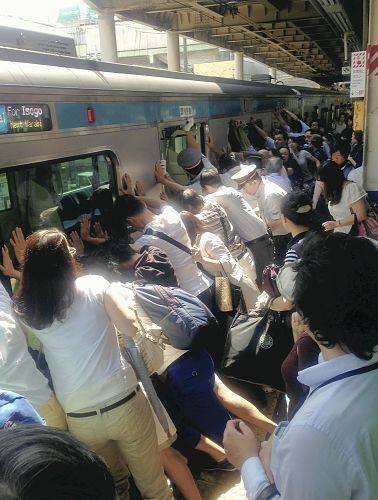 In July 2013, a female passenger in her 30s was getting off the Keihin Tohoku Line at Minami Urawa Station when she fell into the gap between the train and platform edge. She got stuck at her waist. When train station staff pleaded for help, 40 people on the platform and in the train pushed the train to tilt it and free the stuck woman. It took a few minutes and the woman had no serious injuries. The photo was taken by a Yomiuri Shimbun reporter who happened to be there. This summer, there has been a rash of shop employees (convenience stores, restaurants) who posted Twitter photos of themselves in ridiculous and unsanitary poses at their workplace. The photos went viral and they quickly got flamed. Their Twitter accounts have since been shut down, but the incriminating photos have been reposted by others. Of course the employees in question got fired and sometimes even the store was shut down. From top to bottom, the page shows a photo of an employee at Bronco Billy steak house inside a refrigerator. This restaurant branch was shut down because of this photo and he might face a lawsuit. (Made national news.) Then a woman bites into a pack of frozen sausages inside a freezer at Marugen Ramen restaurant. Another employee lies inside a refrigerator at Hotto Motto bento shop. The man resting on a pile of hamburger buns piled up on the floor was fired by Burger King. The bottom photo shows a man lying down on ice cream inside the freezer at Lawson convenience store. A lesson on how to get fired from a part-time job in Japan.